TECNO Mobile is giving every Nigerian (young at heart) with dreams and ambitions an opportunity to win 1 million Naira in the Light up Your Dream 3 competition. A dream they say doesn’t become reality through magic; it takes determination and hard work. What is your dream? Are you ready to take it further and see it become a reality? TECNO Mobile is giving every Nigerian (young at heart) with dreams and ambitions an opportunity to win 1 million Naira in the Light up Your Dream 3 competition. The Light Up Your Dream competition started two years ago and is entering its third edition with the launch of the latest TECNO Spark 3, a device built to capture impressive, bright and clear pictures. So far 8 millionaires have emerged and this year is something everyone should be looking forward to as 7 Nigerians will smile home with 1 Million Naira each. So here comes again an opportunity to everyone with a dream to win the sum of N1million to light up their dream! On Facebook, Post on the under the pinned post in the comment section, On Twitter and Instagram post on your page with the hashtags #LightUpYourDream3, #TECNOSpark3. You can also participate in TSpot by posting on the pinned thread. After submitting your entry, get your friends to like, retweet and share to support you to win. 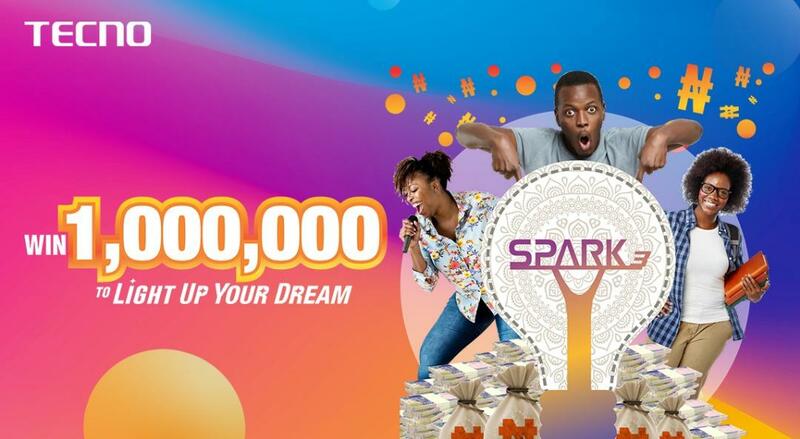 You also stand another chance of winning N1million when you buy the new SPARK 3 device at designated stores across Nigeria. After your purchase, you will get an instant gift and a raffle ticket. The raffle ticket automatically qualifies you for a chance to win N1million via a Raffle Dip. 5 MOST CREATIVE and CAPTIVATING entries will be shortlisted weekly and voted for. 2 entries with the highest number of votes weekly will qualify for the final live pitch while the remaining 3 will be the runner ups. Offline: 5 customers will be selected through the regional raffle draw and will be invited to our Head office and rewarded with their cash prize. The Activity Runs from 3rd April 2019 – 17th May 2019. The screening will commence after the engagement phase. So what are you waiting for? “Don’t let anybody chance you, no let anybody dull you, ignite your passion – according to Teni in Spark 3 theme song. For more information, visit TECNOSpot for Terms and Conditions and follow TECNOMobileNigeria on Facebook, @TECNOMobileNg on Twitter and Instagram.